This is a special aside for all the bloggers out there. Wait! This isn’t baseball-related. Is it? I think it is. Every week, I find more hobby blogs abandoned. Shipwrecked. Likewise, I encounter wise hobbyists who don’t think their insight and opinions matter. Hugh MacLeod is our cheerleader. A sometimes-shocking one, but a needed voice in blogdom. I subscribe to his daily cartoons. He began his artful career drawing on the backs of abandoned business cards. Without his 10-year-old blog (found at www.gapingvoid.com) MacLeod insists his current gig wouldn’t be possible. 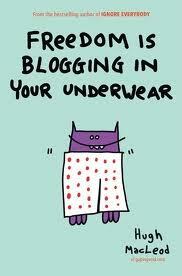 In his book Freedom Is blogging in Your Underwear, Hugh shares some classic cartoons. He drops a couple of F-bombs, flashing a bit of salty language, but makes some clear points. MacLeod has written a love letter to the blog. He feels we can each savor a slice of the blogosphere pie, as long as we bake it ourself. The book is NOT a how-to manual or textbook. At just 117 pages, you’ll find the title is a one-sitting breeze. His chapters read like quickie blog posts. His cartoons sparkle with snarky reality, as MacLeod reminds us why NOT to blog. MacLeod is strong coffee for bloggers and the cyber-wannabes. Freedom is just what we need. Blog on!